Stay warm when the winter weather sets in with a premium heated leather jacket designed for modern style and unmatched comfort. If you struggle to stay warm when it starts to get the slightest bit of cold outside, you don't need to carry around a big, bulky blanket; you simply need a CLIMIX Heated Leather Jacket designed just for women. These premier-quality jackets are form fitting and provide just the right amount of soothing heat so you can fight off the winter chill while staying stylish and active. A smart choice for women who always feel a bit cold even when it's warm and sunny, get this jacket today and never let the chill get the best of you again. 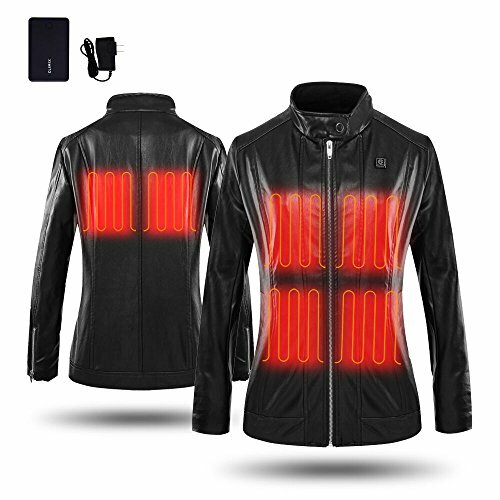 Stay warm and cozy even in the coldest winter weather with this premium heated leather jacket designed for style and comfort; click 'Add to Cart' above to get yours now. All-Purpose Women's Jacket - Each battery-operated heated jacket comes with metal zippered pockets, a front zip closure, and soft, warm polyester lining. Stylish, Trendy Fashion - Crafted with premium PU leather, these slimming heated jackets for women look good with all your favorite fashion styles and wardrobes. Variable Temperature Range - Choose between low, medium, and high heating levels ranging from 100°F to 142°F to find the perfect indoor or outdoor comfort. Ultra-Safe, Rechargeable Design - Fitted with a lithium polymer battery, our jackets produce heat for up to 13.7 hours backed by our smart MCU protection system. Premium Holiday Gift - A great birthday, anniversary, holiday, or Christmas gift for yourself, a friend or loved one; give them as presents before cold winter sets in. If you have any questions about this product by CLIMIX, contact us by completing and submitting the form below. If you are looking for a specif part number, please include it with your message.